This incredible all-inclusive spa and beach resort opened in early November 2017, and it’s running so well already. 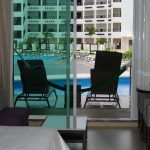 Perhaps that’s because of the decades of experience that management has within the El Cid Resorts system. Or perhaps it’s because they really care—I think it’s a combination of the two! When you’re greeted at the front door by a “Welcome Home” and the right hand over the heart, it’s because these people truly believe in the “mi casa es su casa” philosophy (“my house is your house”). The rooms are spectacular; I stayed in a junior suite on the first floor with the pool right off my patio. I was so busy that I didn’t have much time to spend in the hammock or the lounge chairs, but I did manage to find a couple hours to put on the swim suit and walk right into the pool from my own patio. That’s awesome. You don’t get that experience in too many places; it’s another reminder of the guest-focused detail that went into the design of this beach-front resort. 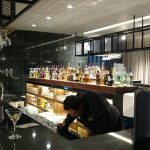 As you walk around, you quickly understand that their hashtag #TheFeelingOf translates to overall enjoyment and pleasure of relaxation, dining, and peace of mind. 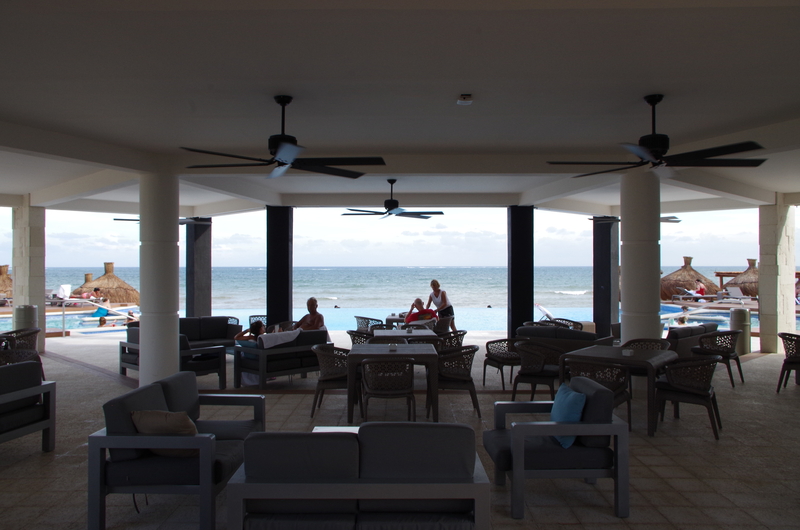 There is an “adults-only” area with an infinity-edged pool that looks out to the beach, two 30-person hot tubs, and a spacious bar/lounge area that’s all set away from the center family-oriented sections of the resort. 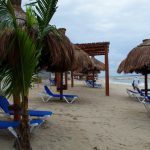 And it’s just a few steps from this area down to the private beach where you’ll find plenty of relaxing lounge chairs under the palapas, and a waiter will come by to bring you a refill of your choice of refreshing beverages. 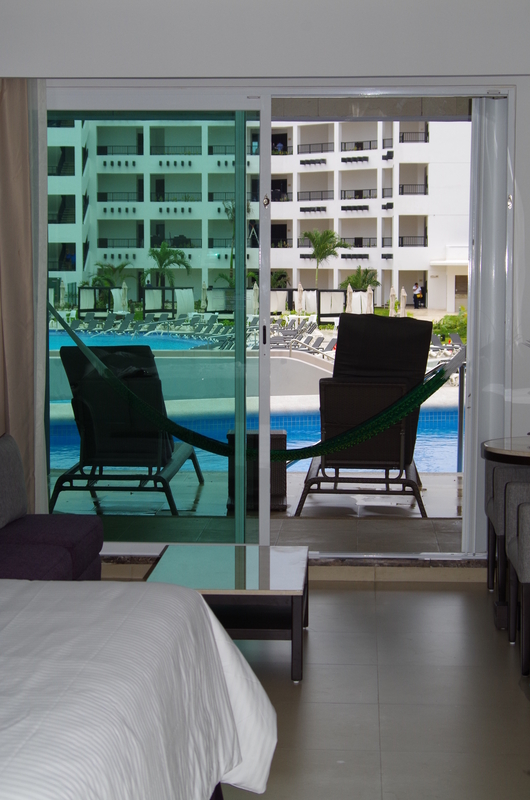 From the beach you walk out into the gentle water and enjoy the delightful Caribbean Sea. Because VENTUS is next door to its sister property Hotel Marina El Cid Spa & Beach Resort, you can walk over there to enjoy some of their facilities, such as the kid-friendly pool with a slide, or the water aerobics classes. If you don’t feel like walking, hop into one of the golf carts and let the friendly staff whisk you there in a jiffy. 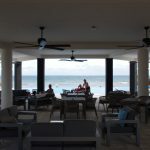 These beach-front resorts naturally center many of their activities around water—pools, spa, fishing trips, boats out to the Puerto Morelos Natural Reef Park (second in size only to Australia’s Great Barrier Reef). I saw quite a few people who were enjoying the tranquility of their patio or balcony as they read a book, played cards, or just engaged in friendly chat with a neighbor. It’s all about relaxation! 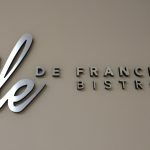 Restaurants? How many do you want? 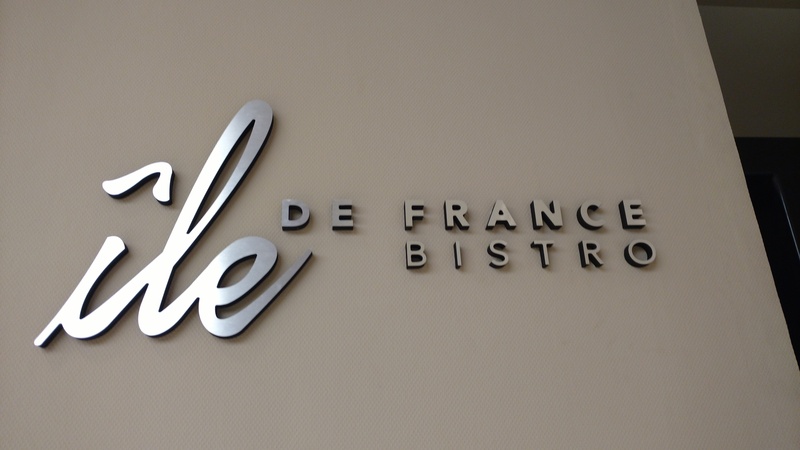 The Île de France Restaurant (please see my separate Restaurant Review) is a celebration of the French ocean liner of the same name, and the food is truly French. 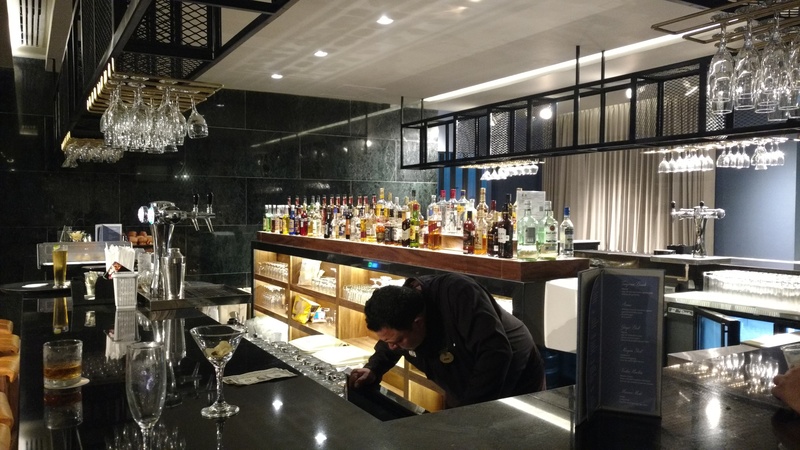 Situated in Ventus’ main lobby building, the restaurant has an amazing selection of wines to accompany the food. On a side note, I liked to see that they enforced a long pants dress code for men. > Fresko – healthy corner with sandwiches, salads, fruit, etc. 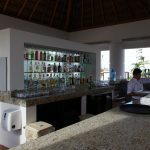 Given that this is an all-inclusive resort, there are plenty of bars to serve you fresh cocktails, non-alcoholic drinks, etc. You can even call your butler and have them delivered to your room (or that early morning coffee before you head out the door). Speaking of coffee, the coffee house is appropriately named Aromas, and you’ll think you walked right into a huge coffee grinder when you stroll inside. I had a Cafe Americana, while others were ordering Lattes, Hot Chocolates, anything you want. The home-made pastries are that perfect addition to your coffee while you sit on the patio (yours or theirs) and enjoy the beginning of another beautiful day in paradise. 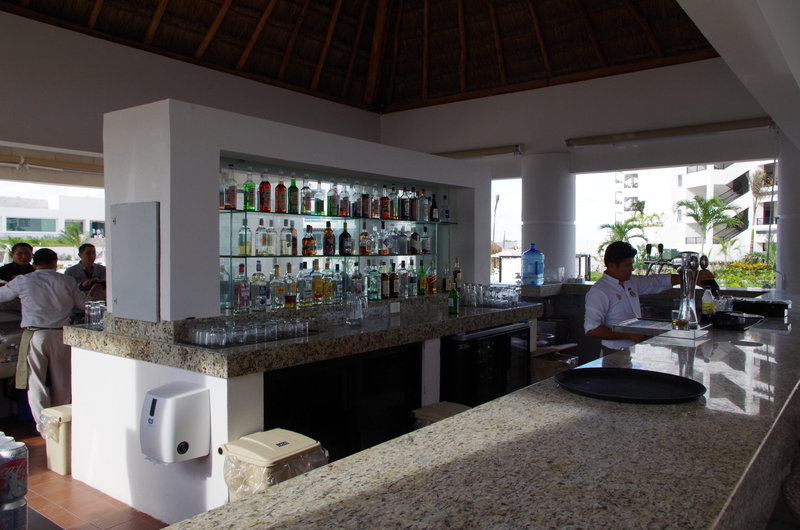 Being in Mexico, they do have quite the variety of Tequilas in their well-stocked bars. 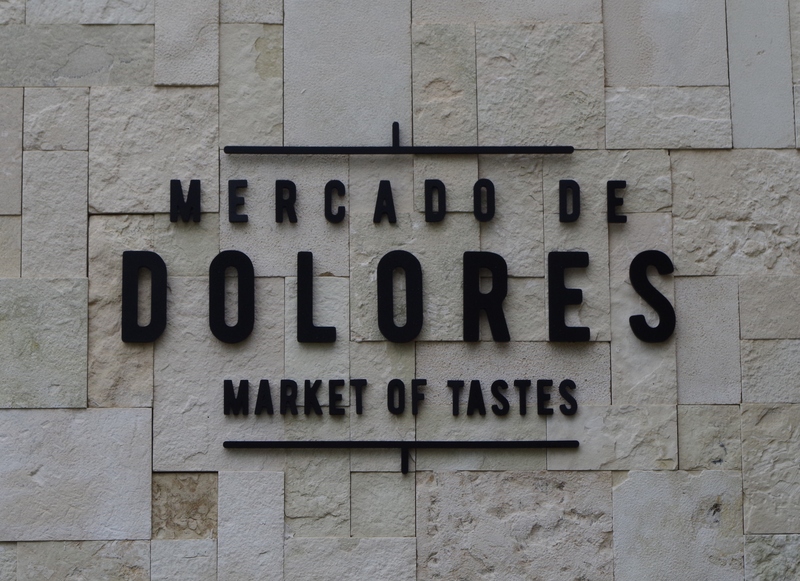 However, they also have a nice selection of Mezcal varieties for you to try, and they even make their margaritas and some other tropical drinks using a flavored Mezcal. What’s the difference between Tequila and Mezcal? 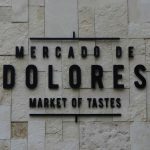 Tequila must be made from the blue agave plant grown in specific regions, while Mezcal can be distilled from any type of Mexican agave. We were treated to a Mezcal Tasting event one evening where we sipped several types of Mexcal, ranging from a smoky to a citrus to a chocolate flavor. They were all good, and it was a good thing there was a golf cart (and driver!) to take us back. 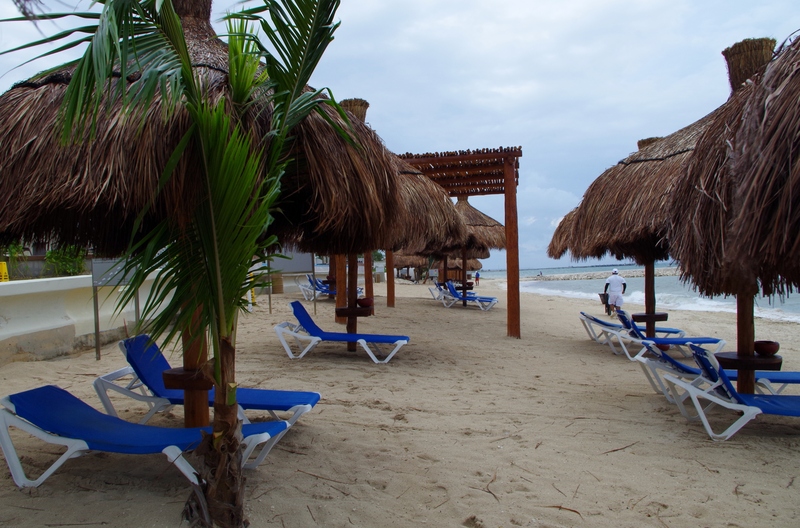 See my blog post on the amazing four-hands Kukulkan massage I enjoyed while there.